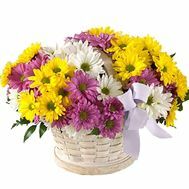 Flower compositions in baskets are the source of the expression of the brightest human emotions and feelings. 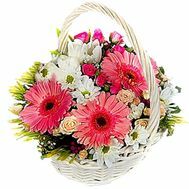 Flowers baskets are inalienable holiday attributes of weddings, anniversaries, graduation balls, concerts, presentations and many other solemn events. Flower baskets are decorated with catwalks, stages, halls of fashionable hotels, showcases of boutiques and expensive salons. 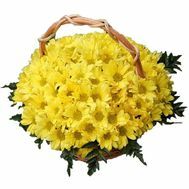 Delivery of baskets of flowers to the originator of the celebration is able to emphasize the sense of taste and sophistication of the sender, as well as his special attention and care. 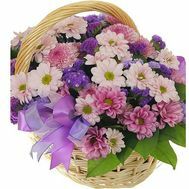 In our online store, anyone can buy a wide variety of compositions with baskets of roses, chrysanthemums, carnations, gladioluses, gerberas, alstromeries, forget-me-nots, daisies, etc. 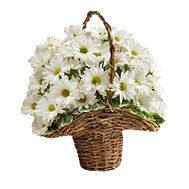 A huge basket of flowers can be exquisitely decorated with stems of decorative curly and ampel plants, cereals, asparagus sprigs, adiantum, cryptomeria, needle. At the request of customers, the basket can be decorated with a variety of decorative elements, including bows, ribbons, beads, feathers, crystals, stickers. 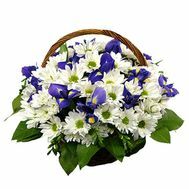 As a rule, a VIP basket of flowers is complemented with souvenirs, gifts, greeting cards, sweets, fruits, expensive wines. 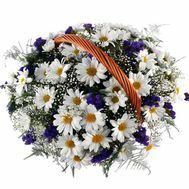 Delivery of flower baskets is carried out by us throughout the territory of Ukraine. Exquisite compositions with fresh flowers can contain a different number of plant specimens (from 15 to 100). Of course, we can issue an individual order with even more colors if the customer so desires. The flower baskets themselves can be made from birch bark, bamboo, straw elements, willow rods, polyamide yarns and metal wire. 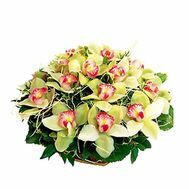 The form of the flower composition will depend on the customer's preferences, the number of plants and their species composition. It can be round, oval, trapezoidal, triangular, S or L-shaped. The choice of a basket with live colors is determined by the nature of the upcoming event, preferences given and intentions of the donor. Making a basket of flowers is a real art of floristry, which includes laborious jewelry work. With special trepidation and diligence our employees approach to each personal order, regardless of its volume and cost, using in its work exclusively fresh and healthy plants. Completed by our masters, even the smallest flower baskets presented to the child, colleague, teacher, friend will look especially attractive and exquisite. Attaching great importance to the reputation of the company, our couriers deliver the order exactly in time, agreed with the client. The delivery service is always accompanied by the effect of surprise, a sense of gratitude and appreciation of the recipients. After all, as you know, flowers are the best gift! 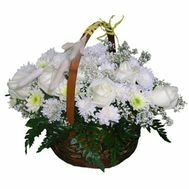 In addition, the delivery of flower baskets to the addressee avoids hassle with the need for a personal trip, saving time and shipping costs of the sender.